Having been on the receiving end of accusations of racism for my criticism of Israel’s appalling treatment of its indigenous people, and being acquainted with many people who make no distinction between Jewish people and the actions of the Israeli state, I’m always very glad to be able to point out that not all Jewish people support Israel’s actions. Further, there are non-Jewish Israelis (just as there are Christian and Jewish Palestinians). And, finally, not all Israelis support their government’s actions. Of course, the majority of Israelis do support their government’s treatment of the Palestinians, to varying degrees within a spectrum that most in the international community finds abhorrent. I’m not qualified to say why, but I suspect it’s a combination of compulsory military service and parental conditioning. It’s true that most Israelis support their government’s actions, just as it’s true that most Israeli chicks are intensely gorgeous. 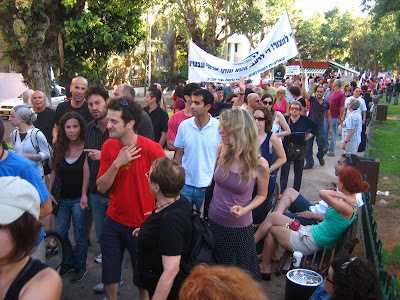 Anyway, last weekend one Israeli peace group, Gush Shalom, marched against the occupation. They took photos. You can see them by clicking on the word: shalom. EDIT: It’s seven years since I wrote this post, and while I’m not going to delete it, I will say that it was unnecessarily crude of me to make sweeping statements about the gorgeousness of women from one particular country or other. I vaguely recall someone referring to that comment years ago as a kind of “see, I can’t be racist, because I’m saying they’re hot”. I bristled at the suggestion at the time, but in retrospect something along those lines may have been at work subconsciously, a pre-emptive response to tiresome ad hominem attacks. A better approach would have been to simply state my thoughts, confident in my knowledge that those thoughts are not driven by racism and unconcerned with what others may think. We live and learn.